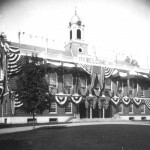 The Town Hall was built in 1902 in response for the Town’s need for civic office space and the Town’s desire to highlight its prosperity and (in the words of Selectman Edgar Bowers) its “Progressive Spirit”. 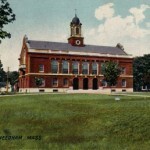 Placed proudly on the Common, the Town Hall remains the most enduring and recognizable image of Needham. Over the past century, the Town Hall has changed remarkably little on the outside. The maples, however, have marked the passage of time; the saplings in the old images are now the venerable trees that shade the Common. Inside the change has been greater, and the Town Hall has been altered as needs arose to meet the increasing complexity of Needham’s modern civic life. 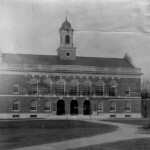 This is the earliest known photograph of the Town Hall, taken just after completion in Winter 1904. It was published in the Needham Town Report for 1903. There are no known photos of the Town Hall actually under construction. The Town Hall rapidly became the subject of photo postcards - a relatively new style of communication in 1900. 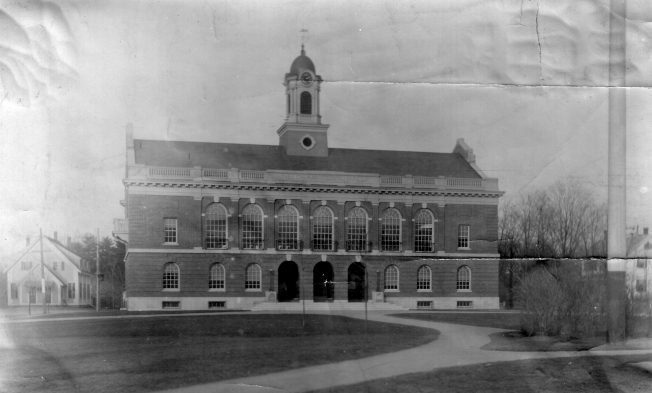 This very early postcard of Town Hall was printed as a color lithograph from a black-and-white photo. It dates to about 1907. 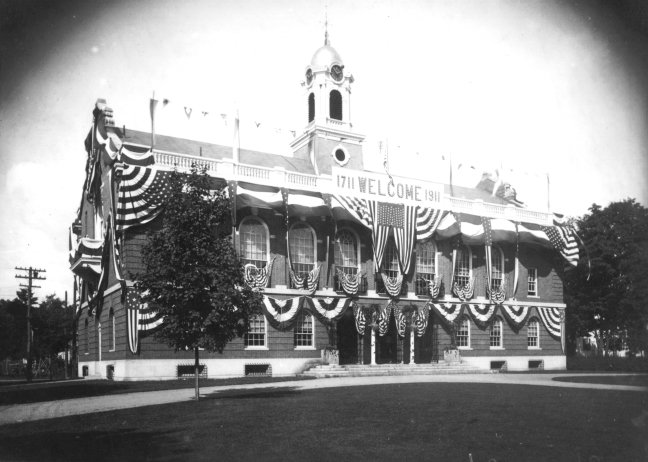 The Town Hall decorated for the Needham Bicentennial in 1911. 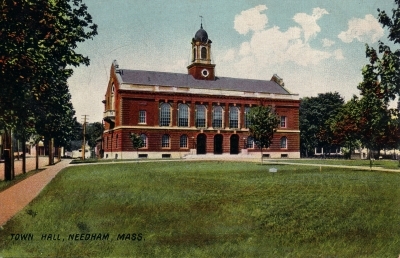 The Town Hall and Common were the focus of Needham's bicentennial festivities. 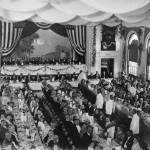 The Bicentennial Banquet. 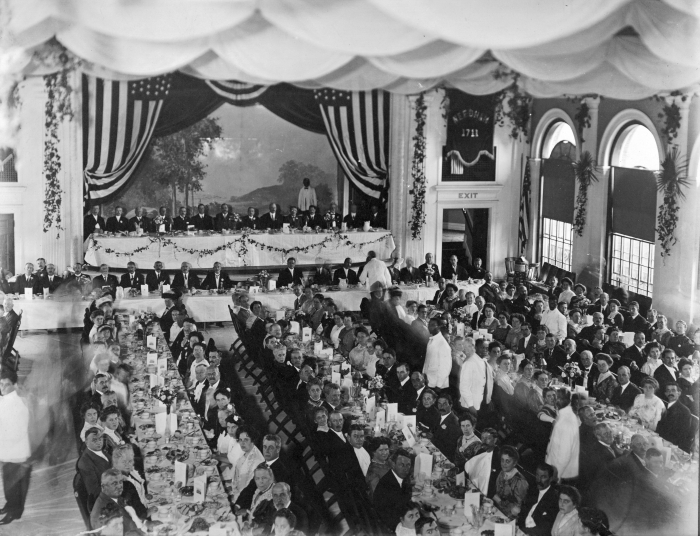 The Town Hall's spacious and elegant second floor was used for Town Meeting and other town functions, such as this banquet to celebrate the Needham Bicentennial in 1911. Partitioned in the 1950s to provide additional space for town offices, the meeting hall was restored to its former use when the renovations were completed in 2011..